Myself, along with several other people on the internet, have discovered the Buzz Bee Water Warriors Charger, a new entry in this year's arsenal. Interestingly, it claims a "dual chamber system for maximum water blasting". After further research, I believe I may have discovered what exactly powers this blaster, and it's not TOTALLY new, but used in a different way. 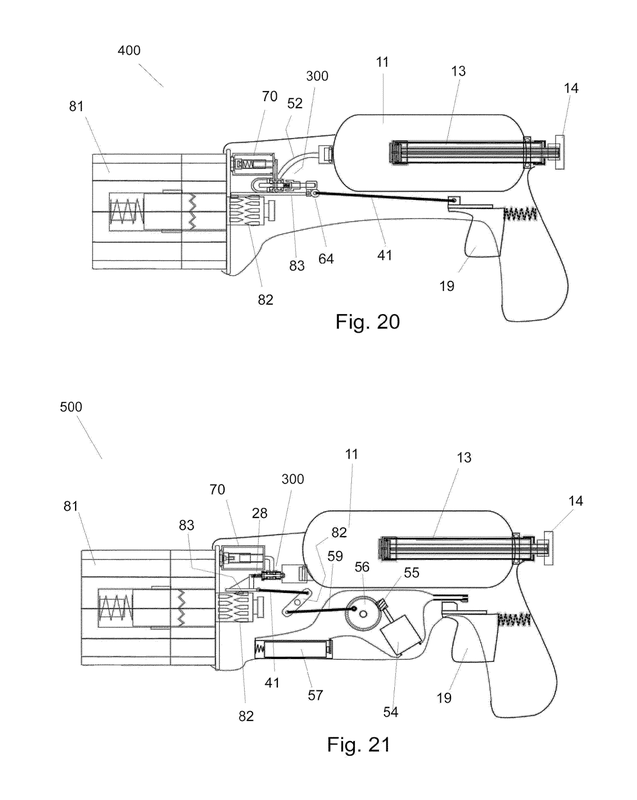 These two patents, one for a Toy Gun With Pneumatic to Hydraulic Pressure Magnifier and one for a Toy Gun With Fluid Firing Switch, list the inventor as Chor-Ming Ma. If you follow the link to the Google Patent search, you'll see inventions all the way back to the days of Larami Ltd. Yep, he's one of the guys who created the Max-D firing valve! Presumably, he helped form Buzz Bee Toys following the dissolution of Larami Ltd. I'll run through the patents as quickly and accurately as possible, and post diagrams from the patents as needed. A 3 way valve linking the backside of the secondary chamber, the air pump/pneumatic pressure system, and the atmosphere. After the initial filling and pressurization, you have a full secondary chamber, with the space behind it open to the atmosphere via a passageway in the valve's o-ring assembly. 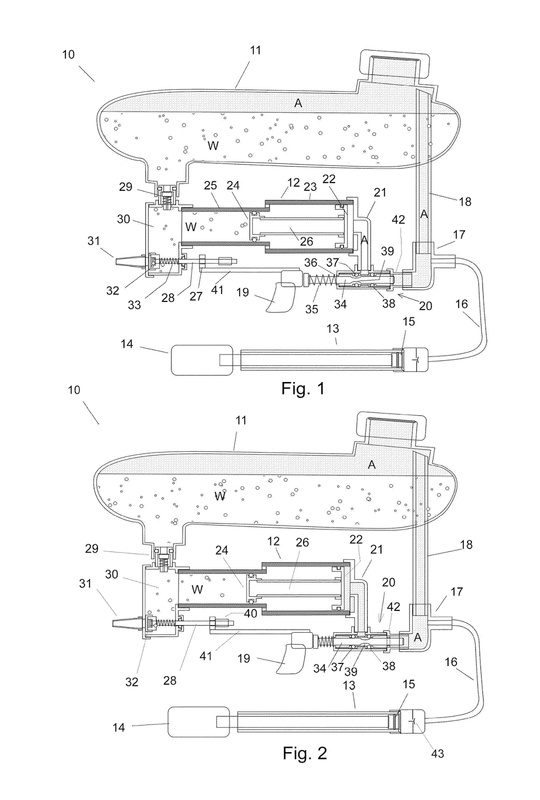 Pulling the trigger not only opens the nozzle, but also changes the 3-way valve configuration, linking the rear of the piston and the air pressure from the first reservoir together. The patent gives an example of having 50 psi pneumatic pressure behind the piston, causing a force to act on it. Notice how the two heads of the piston aren't the same size? That allows the magnification of force by reducing the area the force acts upon. By manipulating the piston head cross section ratio, you could have the smaller head exerting, say, 90 psi of pressure on the water in the secondary chamber. Since this is higher than within the reservoir, the check valve connecting the two stays closed. After the piston moves forward and forces the water through the nozzle, the entire system will be equalized. The air behind the piston is the same pressure as the water at the front of the secondary chamber, so the piston no longer moves. At this point, the system behaves like a normal air pressure blaster, with water exiting the reservoir through a check valve and going out the nozzle. If one releases the trigger before the system is completely depressurized, two things happen. First, the 3-way valve returns to its starting position, emptying out the air behind the piston. Second, water from the reservoir (having nothing opposing it in the secondary chamber) once again fills the secondary chamber until the piston is at maximum displacement. The end result is a blaster ready to fire again, albeit at a lower pressure than before. However, the uneven piston setup in the secondary chamber will still lead to an initial burst upon firing. If desired, the user can pump a few times to raise the pressure of the system again. 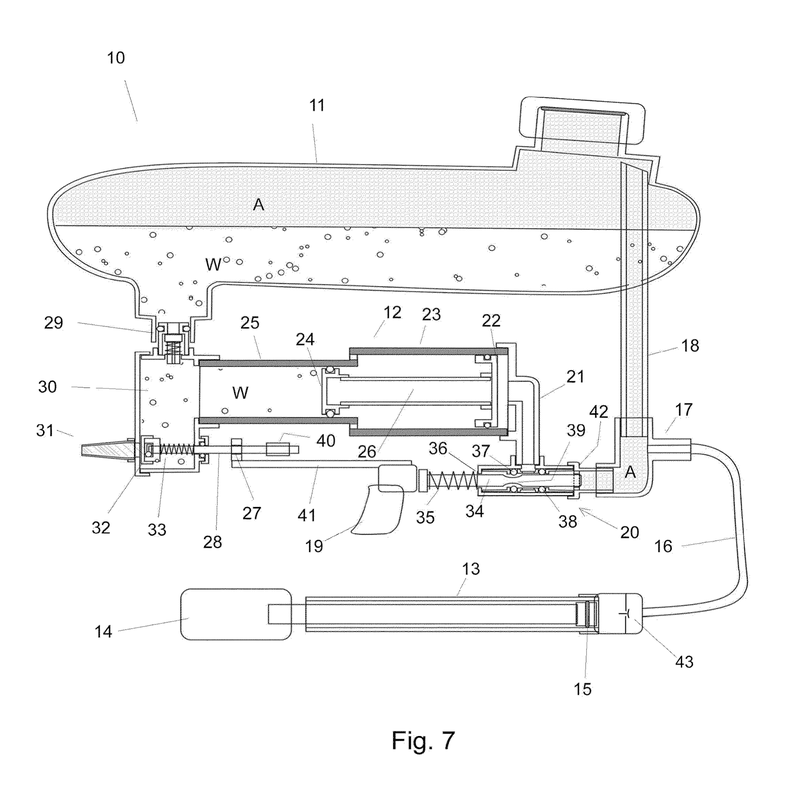 Other diagrams for the fluid firing switch illustrate this system being used with alternate sources of power in the secondary chamber, such as a rubber bladder or a compression spring. 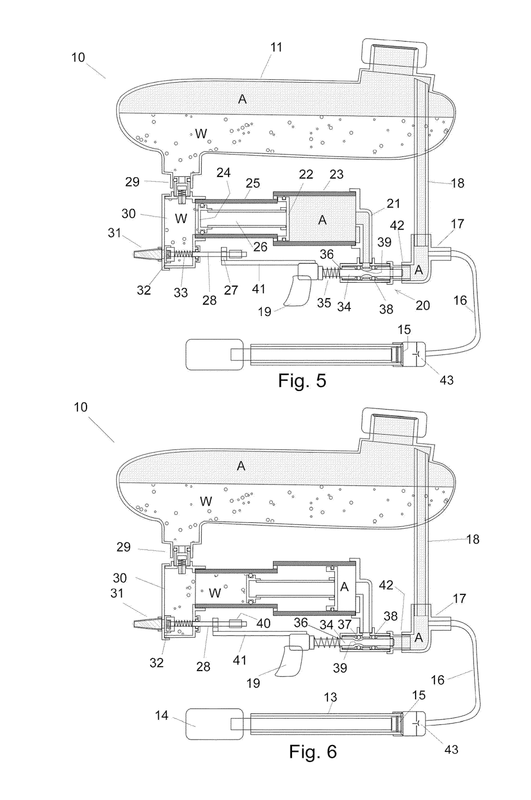 The last few pictures show it when used for firing foam darts - in this case, the valve is set to fill a backpressure tank by default, and pulling the trigger moves the valve to dump the pilot air, firing the tank (and thus your dart). Trigger release returns the 3-way valve to the default position, and refills the firing tank with what remains in the reservoir. Linking the trigger to a turret then allows for a semiautomatic dart blaster. For Nerfers in the know, this is the exact same mechanism demonstrated by Kid Flash's SalvoFly V2. In that case, he used a MAVO-3P valve from Clippard to connect his air pressure reservoir and backpressure tank. Come to think of it, imagine an Air Max 6 or Air Max 10, but with a) a pressure reservoir and b) a valve like this instead of the blast button. Boom, Buzz Bee has an easy way to upgrade the Air Max series. Although I'd personally prefer having an on/off valve for the pressure reservoir. Having semiauto capability is nice, but if you're in a rush and need to fire a dart RIGHT NOW, it'd be nice to close off the reservoir so you can fire after 3-4 pumps, not 30-40. 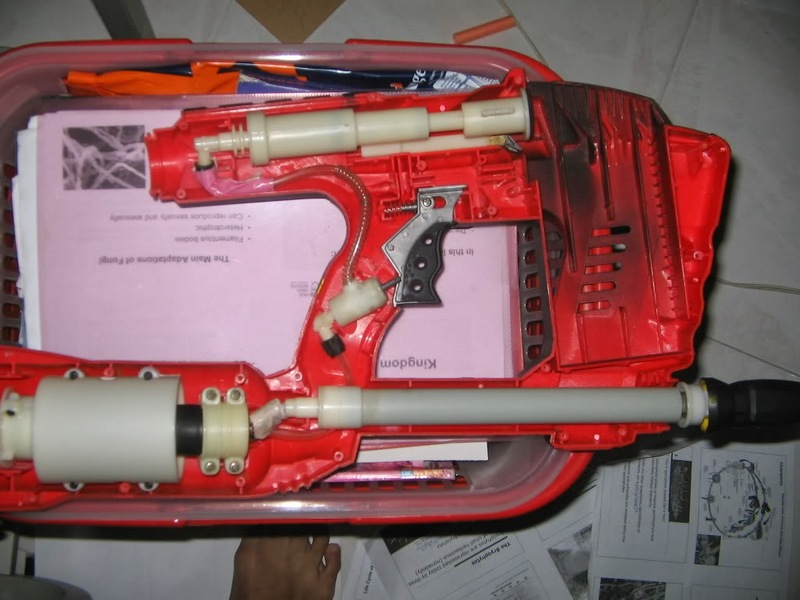 There are other examples of such a mechanism, including installing a backpressure tank in a Nerf Magstrike. Speaking of which...remember the setup for the Charger, with the valve and the area behind the piston being open to the atmosphere at rest? Yeah...that's actually the same thing as the Magstrike trigger mechanism. However, in this case you're not firing rapid bursts of air; you're instead powering a pneumatic cylinder. Try this thought experiment: imagine plugging the air outlet on a Magstrike piston so it cannot fire (and by extension, cycle back and forth). Pulling the trigger would pressurize the piston, moving it all the way forward until it stopped. 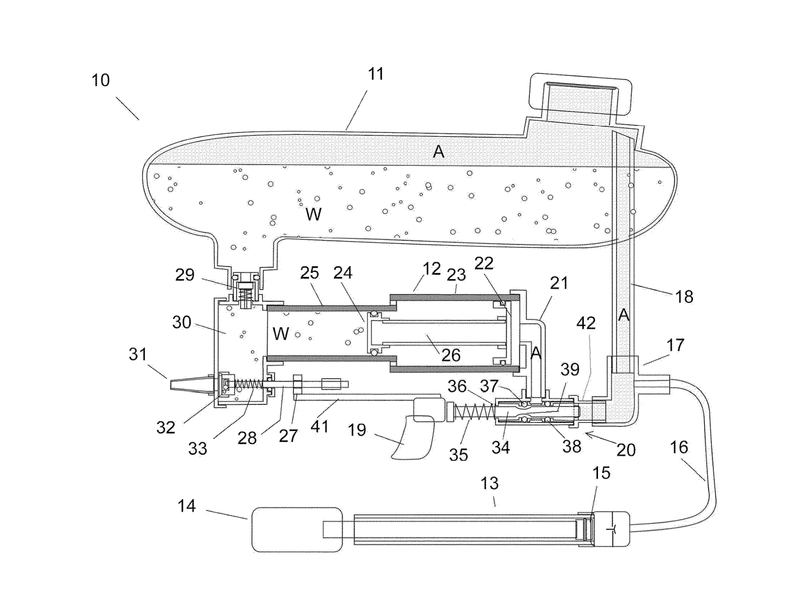 Releasing the trigger would then vent that air to the atmosphere, and the spring would provide the force necessary to reset the piston to its rearward position. The Water Warriors Charger operates in this fashion, in terms of piston operation. Trigger depression fills the area behind the piston, and trigger release vents the air. 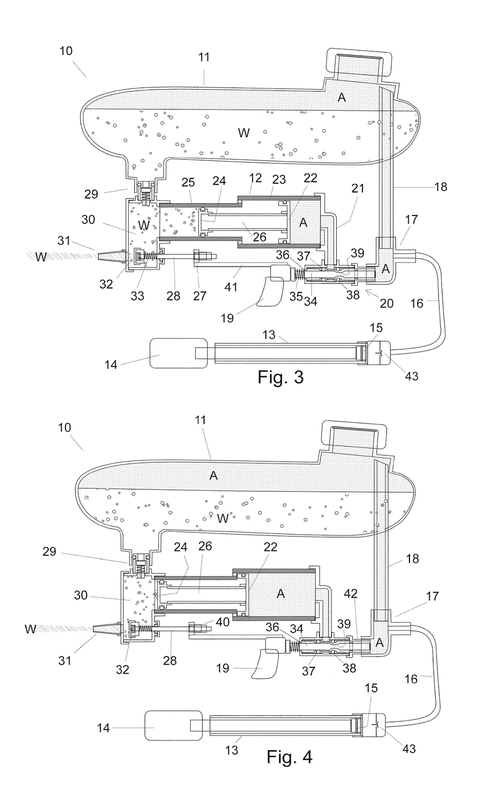 The pressurized water moves the piston back into firing position, as opposed to the spring in a Magstrike. It's the little nuances that make these patents interesting. In terms of commercial products, I can think of several semiauto air blasters, but all of them relied on quickly hitting or pulling a firing pin to fire bursts of air (Light Storm series, Battlemax Sceptor, etc). 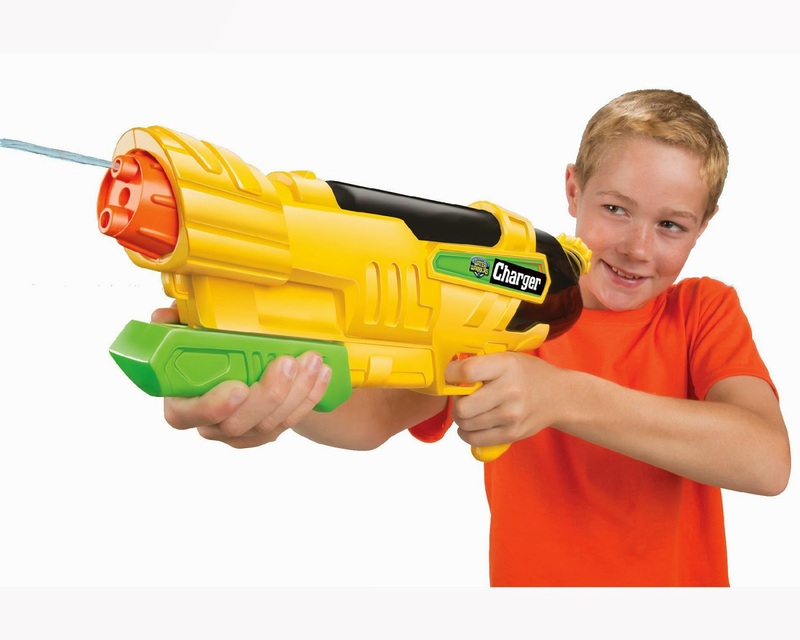 Likewise, nothing revolutionary is inside the water blaster setup. Secondary chambers filled via water pump were a staple in many CPS and XP, but I can't think of a setup where the reservoir automatically filled the chamber when you weren't firing. 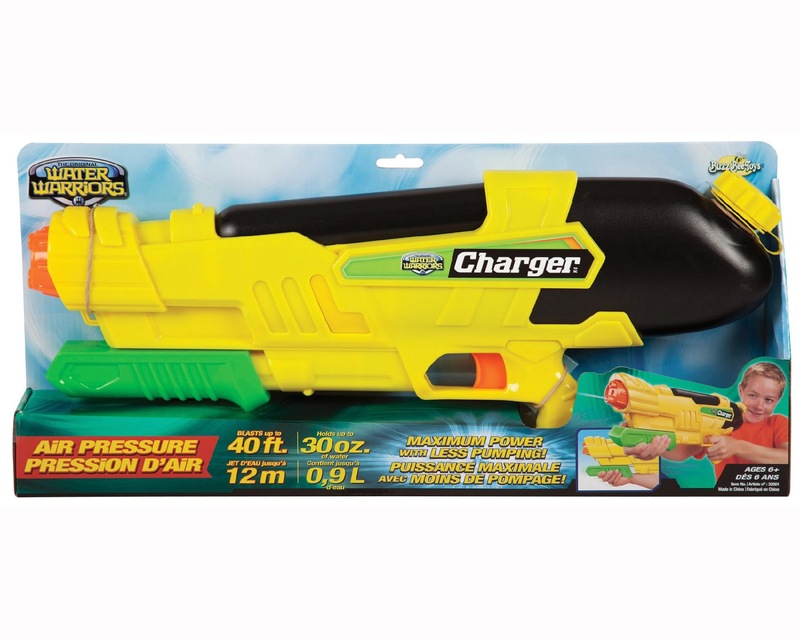 Until I get my hands on the Charger itself, I can only assume the end result of these patents - firing an initial powerful burst before reverting to traditional air pressure blaster operation. But I'm excited to see what Buzz Bee does for both their Water Warriors and Air Warriors product lines! so what you're saying is- I can take the valve system out of this and plop it into an airmax 6/10 with an air bladder and make a semi-auto blaster? Good way to convert toy into a weapon or tool. It may help in work. The person who gave this idea really has a strong thinking mind. I really likes his or her work. Toys R US - What The Hell? Centurion Mods! WHAT SORCERY IS THIS??? ?